The aim of this study was to assess the relationship between endogenous serum dehydroepiandrosterone sulfate (DHEA-S) levels and success of labor inhibition in preterm labor. Preterm birth is the leading cause of neonatal mortality and morbidity. 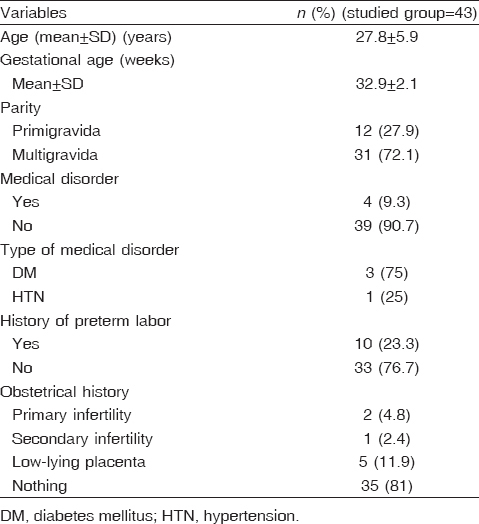 This prospective trial included 43 pregnant women with preterm labor. Labor inhibition was achieved using calcium channel blockers such as nifedipine (epilat 10-mg capsules at a dose of 10 mg orally every 20 min until uterine contractions are inhibited and maintained regularly by epilat retard tablets every 8 h). Serum DHEA-S levels were measured twice, the first just before labor inhibition by tocolytic drugs, and the second sample was obtained after 48 h from starting tocolytic drugs. The levels were evaluated by radioimmunoassay. Ultrasound assessment of the cervix was also carried out. There was a highly significant statistical difference between cases delivered at full term (n = 29) and cases delivered preterm (n = 14) regarding post-tocolytic DHEA-S levels (P = 0.0009). There was a significant statistical difference in pretocolytic levels of DHEA-S in cases that delivered preterm and failed to respond to tocolytic therapy. The cutoff value of pretocolytic DHEA-S was greater than or equal to 94 μg/dl, at which tocolytic therapy failed. Maternal serum DHEA-S concentrations were normal in patients with successful tocolysis compared with elevated levels in patients with failed tocolysis who experienced preterm delivery. Elevated serum DHEA-S levels of more than 94 μg/dl could be used to predict failure of labor inhibition in preterm labor. Considering that preterm birth accounts for about 6–10% of all births in western countries and more than 65% of all perinatal deaths, elucidation of the particularly complicated mechanisms of labor is essential for determining appropriate and effective therapeutic interventions . Labor in humans results from a complex interplay of fetal and maternal factors, which act upon the uterus to trigger pathways leading gradually to a coordinated cervical ripening and myometrial contractility . Whatever the cause of threatened preterm labor, it may be necessary to administer tocolytics, particularly at very early gestational ages (i.e., 29–32 weeks of pregnancy). A great variety of tocolytics have entered obstetric practice in the last two decades: alcohol, magnesium sulfate, β-agonists, prostaglandin synthetase inhibitors, progestin, cyclooxygenase inhibitors, calcium channel blockers, nitric oxide donors, and more recently oxytocin receptor antagonists . The American College of Obstetricians and Gynecologists gave this general recommendation for the use of tocolytic medication in the clinical management of preterm labor: 'if tocolytic drugs are used, the choice of drug should be individualized and based on maternal condition, potential drug side effects, and gestational age' . Parenteral dehydroepiandrosterone (DHEA) is shown to ripen the cervix and has an effect on labor . The most abundant source of DHEA in our blood exists as a 'sulfated' form. This is known as DHEA-S or DHEA sulfate. The active molecule, DHEA, is derived from DHEA-S. At present, this is not well known. Therefore, sometimes, when DHEA-S levels are measured and found to be high, this literally indicates that abundant DHEA is readily available. However, sometimes when DHEA-S levels are measured as high, this also may mean that DHEA is not being produced from DHEA-S. As this is not well known, one has to look at the pattern of this ratio and interpret it in terms of potential pathology. Therefore, sometimes high DHEA-S may indicate negative or adverse conditions. At present, DHEA-S is a measurable biochemical marker of cervical maturation . DHEA-S is an androgenic steroid produced by the adrenal cortexes of the pregnant woman and the fetus . Although its role in the fetoplacental steroid hormone synthesis is well studied, third trimester effects and the importance of third trimester endogenous DHEA-S are not established. Parenteral DHEA is shown to ripen the cervix and have an effect on labor . We aimed to assess the relationship between endogenous serum DHEA-S levels and the success of labor inhibition in preterm labor. Can we predict failure of tocolysis in preterm labor at a certain cutoff value of maternal serum DHEA-S before starting tocolysis? A prospective clinical observational study was conducted from the period between August 2015 and October 2016 at the Obstetrics and Gynecology Department and outpatient clinic of Menoufia University Hospital, Menoufia Governorate. A total of 43 women with preterm labor undergoing labor inhibition were included in the study. The Institutional Review Board and Ethical Committee approved the study, and informed consent was obtained before recruitment of patients. To maintain privacy, all the participants' names were hidden and replaced by code numbers. Inclusion criteria were as follows: preterm labor after 20 weeks of gestation and before completion of 37 weeks (as determined by the last menstrual period if known and/or ultrasonic fetal biometry in the first trimester) with cephalic vertex presentation. Exclusion criteria were as follows: patients with multiple gestations, antepartum hemorrhage, marked intrauterine growth retardation (IUGR), congenital fetal anomalies incompatible with life, rupture of the amniotic membrane, chorioamnionitis, and women in the active phase of preterm labor. Ultrasound assessment of the cervix (cervical biometry): transvaginal ultrasound is performed with an empty bladder. The cervix was visualized in the sagittal plane. It was difficult to see the external cervical os, but by following the posterior lip of the cervix to the intersection of the cervical canal we could identify it. To measure cervical length, markers were placed at the furthest points at which the cervical canal is just exposed. Secondary outcome: cessation of uterine contractions and arrest of cervical changes, increasing time interval between time of start of tocolysis and time of delivery, delay preterm premature rupture of membranes, and improvement of neonatal outcome. Where n is the minimum sample size; z is 1.96 at 95% confidence interval (CI) obtained from a standard statistical table of normal distribution; P is the estimated prevalence of preterm birth in a given population (40% or 0.4, obtained from previous literature); d is the margin of error (0.05); q=(1–p); n = 43 (total). The sample size was calculated according to Steer  who stated that the incidence of preterm labor was 11% in his study. Data were collected, tabulated, and statistically analyzed using a personal computer with statistical package for the social science (SPSS, version 20, IBM Corp., Armonk, NY), and the following statistics were applied. The ROC curve: this is a graph called the receiver operating characteristic curve and is a plot of the true-positive rate against the false-positive rate for the different possible cutoff points of a diagnostic test or marker. P values were of greater than 0.05 were considered nonsignificant, less than or equal to 0.05 were considered significant, and less than or equal to 0.001 were considered highly significant. In the present study, delivery was delayed for more than 48 h in 29 patients, but failed in 14 patients. In the present study, no statistically significant difference between patients in whom labor was delayed (29) and level of pretocolytic DHEA-S as regard time interval between start of tocolysis and delivery of succeeded tocolysis but interval was more than 2 weeks in all 29 patients. In the present study, there was no significant statistical difference between all cases regarding demographic features (maternal age, gestational age, maternal disease, and number of parity) [Table 1]. Regarding Wilcoxon's test [Table 2], there was no significant difference between pretocolytic and post-tocolytic serum levels of DHEA-S in the studied group (P = 0.41). In addition, there was no significant difference between pretocolytic and post-tocolytic serum levels of DHEA-S in cases with failed tocolysis who delivered preterm (n = 14) (P = 0.55). There was a highly significant difference between those who delivered at full term and those who delivered preterm regarding post-tocolytic DHEA-S (P = 0.0009). There was no significant correlation between pretocolytic DHEA-S level and cevical length by ultrasound in patients who failed to respond to tocolytic therapy and delivered preterm. There was a significant difference in pretocolytic levels of DHEA-S in cases who delivered preterm and failed to respond to tocolytic therapy [Table 3]. The cutoff value of pretocolytic DHEA-S was greater than or equal to 94 μg/dl, at which tocolytic therapy failed and cases delivered preterm. Maternal serum levels of DHEA-S can be used as a predictor of success of tocolysis in preterm labor with sensitivity of 92.9%, specificity of 76%, positive predictive value of about 92%, and negative predictive value of about 90% [Table 4] and [Figure 1]. Figure 1: Receiver operating characteristic curve for maternal serum dehydroepiandrosterone sulfate level before starting tocolysis in preterm labor. The present study was conducted at Menoufia University Hospital to evaluate the association between serum DHEA-S level and success or failure of tocolytic therapy in 43 patients facing preterm labor. The results of the present study showed that delivery was delayed for more than 48 h in 29 patients, but failed in 14 patients. It was found in the present study that there was no statistically significant difference between patients in whom labor was delayed (29) and level of pretocolytic DHEA-S with regard to the time interval between start of tocolysis and delivery of successful tocolysis, but the interval was more than 2 weeks in all 29 patients. This is consistent with the study by King et al. , who compared calcium channel blockers with other tocolytic agents and found a statistically significant decrease in the number of women giving birth within 7 days of initiation of treatment (relative risk = 0.76; 95% CI = 0.60–0.97) and before 34 weeks gestation (relative risk = 0.83; 95% CI = 0.69–0.99). The number needed to treat for the outcome of birth within 7 days is 11 (95% CI = 6–100). In the present study, there was no significant statistical correlation between cervical length measured by transvaginal ultrasonography, inhibition success, and pretocolytic levels of DHEA-S in patients who delivered preterm. These findings are not consistent with the study performed by Tsoi et al. , where in 173 cases the cervical length was greater than or equal to 15 mm and only one of these women delivered within 7 days. We suggest in the following citations that connect high levels of DHEA-S can be related with preterm delivery. Maternal plasma DHEA-S concentrations were signifi cantly higher in women with preterm labor who delivered preterm than in those who delivered at term. We found in the present study that there was no significant difference between pretocolytic and post-tocolytic serum levels of DHEA-S in patients with failed tocolysis who delivered preterm, but its level increased above the cutoff value of DHEA-S obtained by this study using ROC curve analysis of 94 μg/dl. These results are consistent with a previous study by Mazor et al. , who conducted a cross-sectional study based on the gestational age at admission and response to tocolysis. Another study was carried out to determine the relationship between human fetal plasma cortisol and DHEA-S and the onset of preterm labor in patients with preterm, premature rupture of membranes. An elevation in fetal plasma cortisol but not DHEA-S was followed by the onset of spontaneous preterm labor in patients with preterm premature rupture of membranes. Patients who went into spontaneous labor and delivered within 7 days of cordocentesis had a significantly higher median level of fetal plasma cortisol but not of DHEA-S than those who delivered after 7 days. A study by Goolsby et al. showed that DHEA-S levels are a factor influencing labor efficiency in women with term and post-term pregnancies. Maternal serum levels of DHEA-S are significantly lower in those clinically requiring pharmacological augmentation than in those progressing spontaneously through labor. DHEA-S may be an important factor in efficient labor. In addition, Liapis et al. reported an association between higher Bishop scores and higher DHEA-S levels. In a recent study by Sherif et al. to evaluate the relationship between maternal DHEA-S and success of labor induction in prolonged gestation, 50 women with prolonged pregnancies greater than 41 weeks were included. There was a significant direct correlation between serum DHEA-S and Bishop's score – a higher DHEA-S is related to a higher Bishop's score (r = 0.785; P < 0.001). 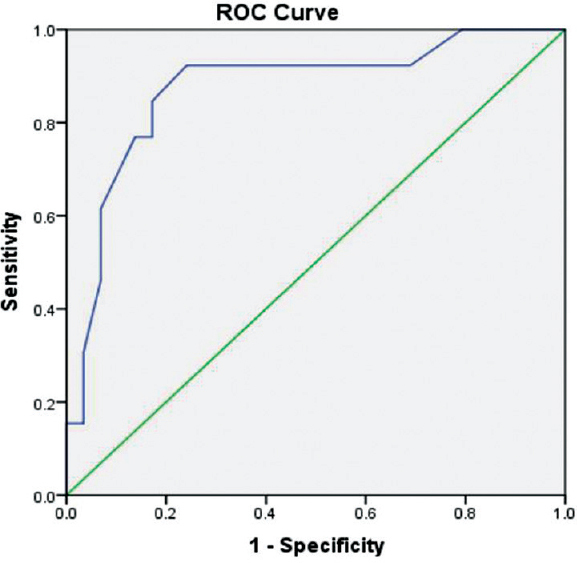 Using ROC curve, serum DHEA-S at a cutoff level of 90.6 μg/dl was a predictor of successful labor induction with 97.2% sensitivity and 92.3% specificity. Another more recent study by Okunowo et al. , evaluated maternal serum levels of DHEA-S in spontaneous labor and its association with successful labor at term. Serum DHEA-S levels were higher among parturients with successful labor compared with women with unsuccessful outcome (P < 0.001) . DHEA-S levels were also higher among parturients who did not require oxytocin augmentation compared with those who required it (P < 0.001) . Inability to recruit a larger number of patients was a major limitation of our study. Larger studies are needed to confirm or refute our findings. By using ROC curve analysis, in this study, we determined the best cutoff point of serum DHEA-S of 94 μg/dl as a predictor of successful labor inhibition, with a sensitivity of 92.9%, specificity of 76%, positive predictive value of 92%, and negative predictive value of 90%. Patients with threatened preterm labor will not respond to tocolytic therapy if maternal serum DHEA-S is greater than 94 ug/dl, and thus patients should be counseled and prepared for delivery. Abd Elaal NK, Sanad ZF, Dawod RM, Mnasir SM. Vaginal progesterone and cervical cerclage for preterm labor prevention and their impact on perinatal outcome. Menouf Med J 2015; 28:864–872. Smith R, Mesiano S, Chan EC. Corticotropin releasing hormone directly and preferentially stimulates dehydroepiandrosterone sulfate secretion by human fetal adrenal cortical cells. J Clin Endocrinol Metab 1998; 83:2916–2920. Van Geijn M, Joris E, Annemieke C, Stuart R, Vanessa K, Anthony L. Nifedipine trials: effectiveness and safety aspect. BJOG 2005; 112:79–83. Helmer H. Frequently asked questions on tocolysis. BJOG 2005; 112:94–96. Rechberger T, Abromson SR, Woessner JFJ. Onapristone and prostaglandin E2 induction of delivery in the rat in late pregnancy in late pregnancy: a model for the analysis of cervical softening. Am J Obstet Gynecol 1993; 168:1598–1603. Goolsby L, Kerry S, Racowsky C, Gelety T, Reed K. Maternal serum dehydroepiandrosterone sulfates levels and the efficiency of labor in young nulliparas. Obstet Gynecol 1996; 88:56–59. Steer PJ. The epidemiology of preterm labour – why have advances not equated to reduced incidence? Br J Obstet Gynaecol 2006; 113 (Suppl 3):1–3. King JF, Flenady VJ, Papatsonis DNM, Dekker GA, Carbonne B. Calcium channel blockers for inhibiting preterm labor (review) the Cochrane collaboration. John Wiley & Sons Ltd; Hoboken, NJ: 2007. pp. 1–5. Tsoi, E, Akmal, S, Rane, S, Otigbah, C, Nicolaides, KH. Ultrasound assessment of cervical length in threatened preterm labor; Ultrasound Obstetrics Gynecol 2003; 21:552–555. Mazor M, Ghezzi F, Cohen J, Hershkovitz R, Tolosa JE, Levy J, et al. Maternal plasma and amniotic fluid dehydroepiandrosterone sulfate concentrations in preterm labor and delivery. Arch Gynecol Obstet 1996; 259:7–12. Liapis A, Hassiakos D, Sarantakou A, Dinas G, Zourlas PA. The role of steroid hormones in cervical ripening. Clin Exp Obstet Gynecol 1993; 20:163–166. Sherif YS, Amr HF, Magd EI Din MM. Relation between dehydroepiandrosterone sulfate (DHEA-S) and success of labor induction in prolonged gestation. Asian Pacif J Reproduction 2013; 2:312–315. Okunowo AA, Adegbola O, Ajayi GO. Evaluation of maternal serum levels of dehydroepiandrosterone sulphate and its association with successful labour outcome among parturients undergoing spontaneous labour at term. J Obstet Gynaecol 2017; 37:191–194. Doganay M, Erdemoglu E, Avşar AF, Aksakal OS. Maternal serum levels of dehydroepiandrosterone sulfate and labor induction in postterm pregnancies. Int J Gynaecol Obstet 2004; 85:245–249. Torricelli M, Voltolini C, Galleri, L, Biliotti G, Giovannelli A, De Bonis M, et al. Amniotic fluid urocortin, CRF, estriol, dehydroepiandrosterone sulfate and cortisol concentrations at mid-trimester: putative relationship with preterm delivery. Europe J Obstetrics Gynecol Reproductive Biol 2009, 146:169–173.